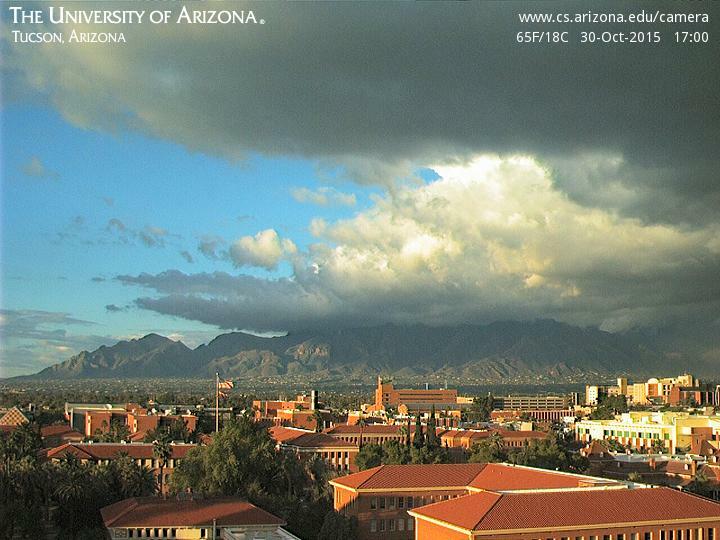 A storm boiled up over the Catalinas late yesterday afternoon and moved southward across parts of central Tucson. 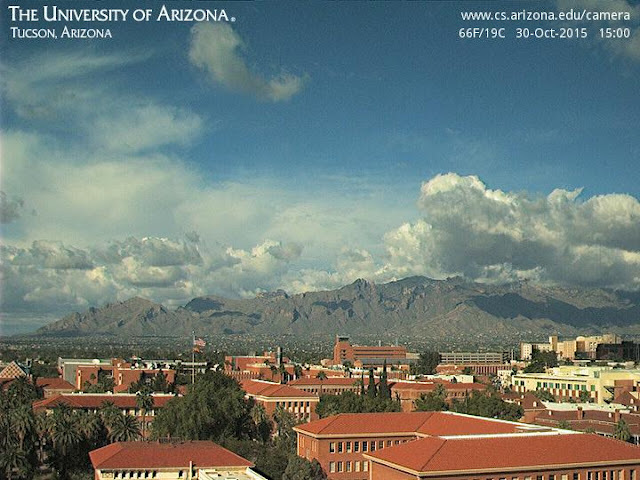 The web cam sequence here from the University of Arizona campus shows the view to the north from 3:00 to 5:00 pm MST. The storm was fast hitting and produced thunderstorm observations at both TUS and DMA. The maximum rain amount I saw for this storm from the ALERT network was 0.47" at a station south of DMA. The storm produced a brief, heavy downpour here at the house that left 0.16" in the rain gauge. That makes the total for this entire, end of October, weather event 0.47" - quite a nice rain event and also month. The temperature this morning is definitely in the 30s F here, but I won't know the low for a couple of hours. The 500 mb closed low circulation is currently a bit to the northeast of Tucson and opening up as system moves eastward and southward. This weather event again unfolded in two stages. During the day yesterday there were periods of showers and thunderstorms across eastern Pima County, but with mostly light amounts, except right around the Rincons and Redington Pass. 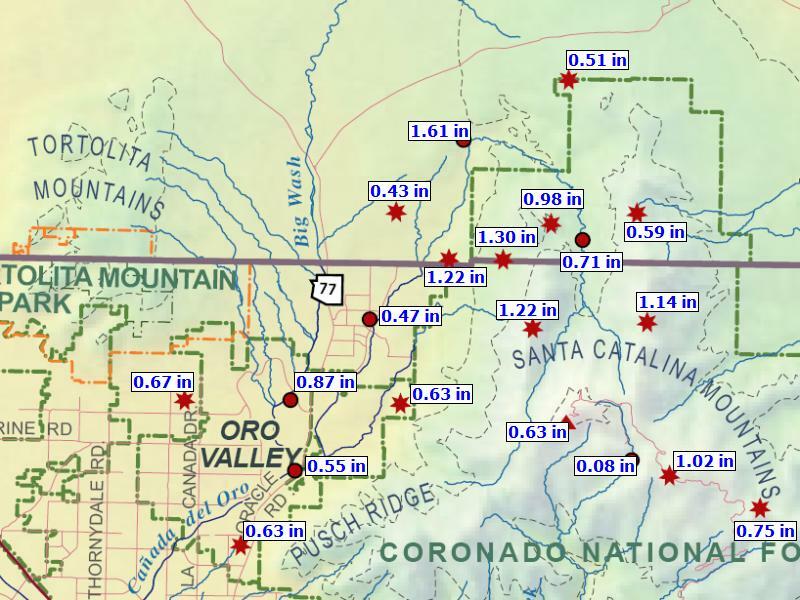 About 45% of the ALERT sites measured rain yesterday with the notable amounts being nearly 1.5 inches at both Italian Trap Tank and Mescal sites at north and south ends of the Rincons. After midnight, showers became more widespread with 100% of the ALERT stations measuring rainfall. Four stations around the Rincons ended up with more than an inch and the total at Italian Trap reached 2.13". Here at the house we had 0.31" at 6:00 am MST but there have been more showers since then (see the 6:14 am radar chart above). Thunderstorm activity after midnight shifted southward and eastward away from the metro area. 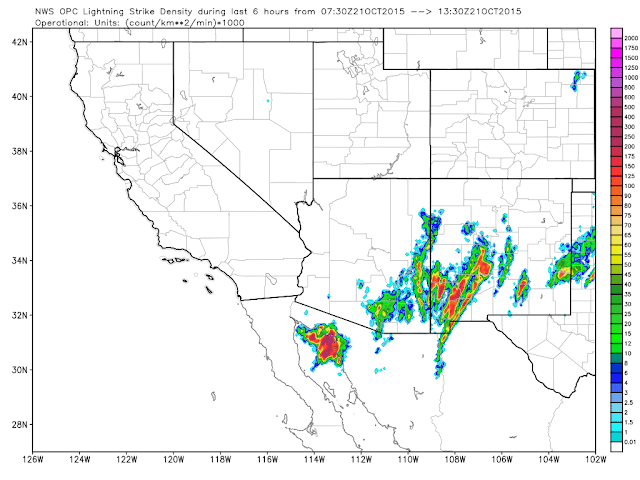 The plot of CG flash density (below for 24-hours ending at 6:00 am, from weather.graphics and Vaisala) shows how widespread thunderstorms were across much of Arizona. The WRF model forecasts from Atmo indicate showers into early afternoon, before skies begin to clear for what will probably be the coolest night of the Fall so far. Depending on when the skies clear, temperatures may drop in the upper-thirties here along the Rillito (note it did drop to 40 F already this month here on the 23rd and 24th). There are showers and some thunderstorms bubbling around much of southeast Arizona this morning, with quite a few CG flashes being detected, particularly in Pinal County. Composite radar above is from 7:19 am MST and visible satellite image below is from 7:15 am. The morning skewT plot for the TWC sounding is shown second below (from SPC) and indicates strong steering level winds for rapid storm movements to the northeast. The layer with a fair amount of CAPE (about 750 to 350 mb) is shallow but indicates considerably updraft velocities through the -10 to -20 C region, so the CG flashes are not surprising, even though storm tops are low. The WRF forecasts from Atmo have trended toward less precipitation with this event than was forecast yesterday, especially in the 06 UTC GFS version. Shown here are the 06 UTC WRF-NAM forecast above of accumulated precipitation through noon tomorrow (Friday the 30th), while below is the same forecast from the WRF-GFS. 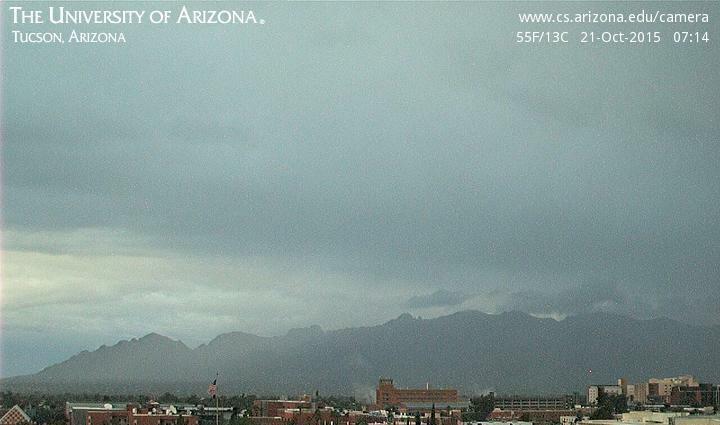 The GFS version is now only slightly wetter than the NAM, while yesterday it was very wet over in Cochise County. However, this third or fourth event for October, making this a quite good month for rainfall down here at lower elevations. The day has dawned overcast and gray here in Tucson, as heavy middle and high cloudiness moves in from the Pacific. View above of Catalinas is from 7:40 am MST. The visible satellite image (below from 7:45 am) shows very widespread cloud cover over all of the Southwest. The models are in somewhat reasonable agreement this morning, which is good since our southeast Arizona weather event unfolds tomorrow into Friday morning. The early cloudiness has come in with the leading shortwave, that is quite weak - the 500 mb chart above is the NAM analysis for 12 UTC this morning. The amplifying short wave that will bring our weather event is still off the west coast. It appears that this feature will be more progressive than the long-range ECMWF forecasts indicated but also deeper and further west than the long-range GFS forecasts indicated. So an event that evolves a bit differently than either model forecast, with no clear winner or loser. The NAM and GFS are still somewhat different in the details of the weather over southeast Arizona. The NAM continues considerably drier than the GFS, and this was reflected in the 06 UTC WRF forecast runs at Atmo. The NAM version ends precipitation over eastern Pima County during the evening tomorrow, while the GFS version continues the event into mid-morning Friday. The WRF-GFS forecast of accumulated precipitation through 11:00 pm MST is shown below. All of southeast Arizona receives precipitation in the GFS variant, although the focus for heavier amounts is over in Cochise County and the mountains. Both versions of the model forecast rainfall at the airport of 0.30 inches. The global models have trended toward a middle ground for the end of week system. Shown here are the 72-hour 500 mb forecasts from last evening, valid at 5:00 pm MST on Thursday afternoon - ECMWF above and GFS below. The systems have similar structures now, but the GFS remains about 12-hours faster than the ECMWF. The NAM at 72-hours (above) is similar to the GFS, but with considerably weaker vorticity maxima. So, it is still a bit of a monitoring situation re how all this turns out. The WRF model forecasts from last evening are indicating a wetter event for the GFS version. The WRF-GFS forecast of accumulated precipitation through 5:00 pm MST on Friday the 30th is shown below, indicating heaviest amounts at higher elevations, but with rain across all of eastern Pima County. The 500 mb pattern across the north Pacific has been rapidly evolving during the past few days ( above is the GFS analysis from 00 UTC last evening). The rapid development of this high amplitude pattern has been causing spasms within global forecast models. There is a nice discussion of the model vagaries impacting the forecast through the weekend at the NWS Tucson webpage - see the 4:20 am MST forecast discussion (FD). Graphic below is the MIMIC PW analysis for 11 UTC this morning (from CIMSS at University of Wisconsin). The southeast tail of the intense cyclone south of the Aleutians evolves into the late week system that will impact the Southwest. Both of these analyses indicate that the remnants of once Hurricane Olaf are being picked up by the system to its northwest - the evolution of the strong PW plume into Olaf from the tropics may be the wild card in our events come the end of the week. By early yesterday the ECMWF and GFS operational forecasts had come into fair agreement - with GFS trending a closed low over the Southwest and the ECMWF becoming a bit more progressive with the low. But the 00 UTC 120-hour forecasts have again diverged, illustrating the difficulty of the current situation. Forecast above is for 500 mb from the GFS and is valid at 00 UTC on the 31st. The ECMWF forecast below is for the same valid time as GFS above. The ECMWF continues with a closed low over the Southwest and is still 100 m or so deeper over parts of southern Arizona. The ECMWF has been more stable in its forecasts over the past few days than has the GFS. The October pattern for the Southwest has featured two, and now perhaps three, closed lows in the southern branch of the 500 mb flow pattern. If this is a harbinger for our coming El Nino winter, then it will be an exciting season for us. Finally, the forecast challenge is well illustrated by the rapidly changing precipitation forecasts from the GFS. Above is total precipitation forecast from the operational version (168-h valid through 06 UTC on November 1st) indicating a significant precipitation event for all of the Southwest. However, the current 00 UTC 120-hour forecast of total precipitation (valid through 00 UTC 31 October) is very much different. The heavier precipitation has shifted northward, while Arizona and New Mexico get significant precipitation mainly in the White and Mogollon Mountains, with little elsewhere. What will tomorrow morning's forecasts bring? The planets Venus, Jupiter, and Mars have been close-dancing around the morning sky the past week. This morning Venus and Jupiter were very close, with Mars just off to the left. Unfortunately I was not quite early enough to catch all three in the Mt. Lemmon sky cam. 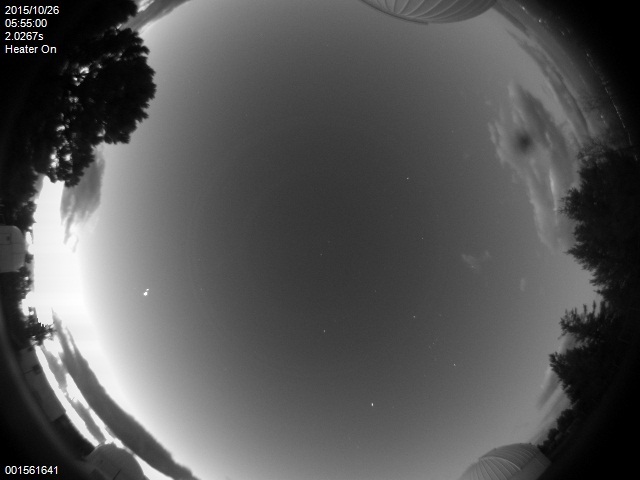 The above image is from 5:55 am MST and shows Venus and Jupiter on the east (left) side of image. But Mars is lost in the light from the about-to-rise sun. This unusual show will continue through the week, but viewing conditions will likely be deteriorating as the week progresses. Thanks to Carl Hergenrother for sending links for the nearby observatories - I'll share these when I get a chance. I can not resist venting a bit after seeing this weather story from NWS Tucson this morning. The pretty graphics and colorful cartoons that many/most NWS Forecast Offices are producing for users these days are too often superficial and lacking in technical explanation. What is shown on these two weather maps? What are the yellow lines? What does the colored shading mean? Certainly no explanations are provided in this "story." And my pet peeve - what does "a piece of energy" mean? If a user goes to the NWS Glossary of technical terms to find out what this means they will be out of luck, since there are no entries for "energy" nor "piece of energy". No explanations of what kind of "energy" is being discussed are provided by the writer. Unfortunately, more and more forecasters seem to be using the "energy" term, which is essentially meteorological gibberish or jargon. Yet again the two models have dramatically different forecasts for the Southwest - both from 12 UTC this morning and valid at 168-hours (12 UTC on Friday the 30th). The ECMWF (above) forecasts a strong closed low over Arizona/Utah, while the GFS (below) has weaker, short-waves over Texas Panhandle and west of Salt Lake. The height differences in the forecasts are almost 200 m over central Arizona. Latest NHC discussion indicates Patricia is a Cat. 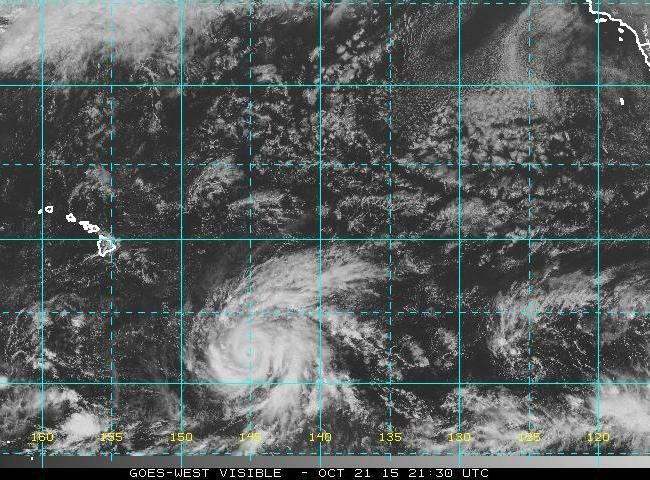 4 hurricane this afternoon - with further strengthening possible tonight. The images here (visible above and water vapor below) are from 2145 UTC this afternoon. A very beautiful morning in Tucson with clear skies, clean air, and cool temperatures following yesterday's rains. 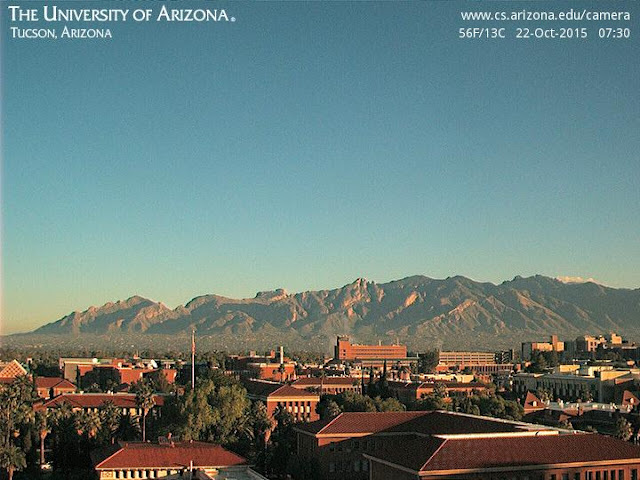 View above is from campus looking north at 7:30 am MST. Wore a light wind-breaker when I walked for first time this Fall. Low here at house was 42 F versus low 50s at the airport. There were some thunderstorms around eastern Pima County yesterday afternoon - CG flash density below is from weather.graphics and Vaisala for 6-hours ending at 6:45 pm and indicates storms near by. We had another 0.08" of rain yesterday afternoon but I did not hear thunder, but that does not mean much, since I had my hearing aids out. If one looks at 24-hour rainfall across the ALERT network for past 24-hours the data capture portions of the early morning event as well as the afternoon showers. So, I took a look at the network data for the period from 11:00 am through 11:00 pm last night. During that period 53 sites (~55 % areal coverage) had rainfall. Amounts were generally under a tenth of an inch, with Mt. Lemmon site having most rainfall at 0.39". I continue to feel that the ALERT data, a valuable mesoscale data set, are probably under-utilized locally. Far to the south, Hurricane Patricia is strengthening rapidly and is forecast to make landfall as a major hurricane. Above is morning visible image of Patricia at 1345 UTC and below is the morning forecast for the storm from the NHC. Hurricane Olaf, a Cat 3 storm, has moved into the Central Pacific Basin, and is located southeast of the Big Island. Visible image above is from 2130 UTC. The hurricane is forecast to turn northward and pass to the east of the Big Island. Tropical Storm Patricia developed off the southern Mexican coast and has been intensifying today . 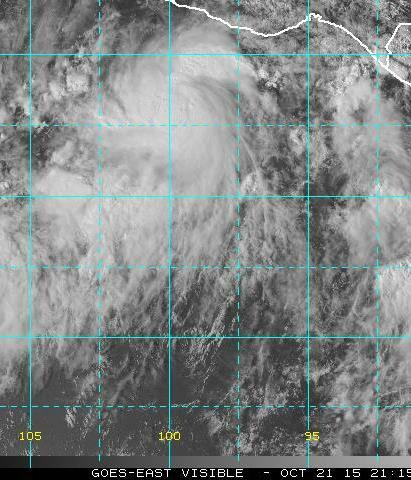 She is expected to become a hurricane shortly and a hurricane warning is already in effect from Cabo Corrientes southward, where the storm is expected to make landfall on Friday. Thunderstorms both in the evening yesterday and again after 4:00 am MST this morning. 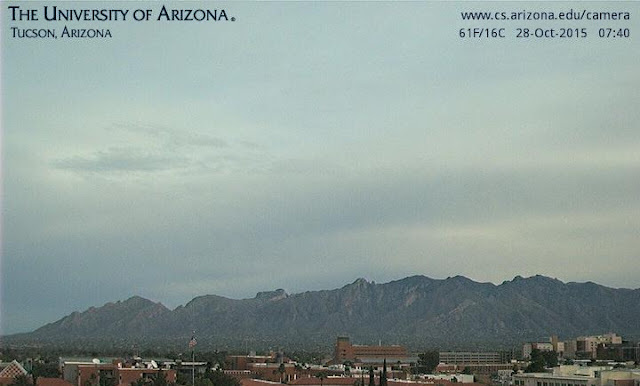 Above is a damp and dreary view of the Catalinas from campus at 7:14 am and below is the 7:00 am NWS TUS composite radar graphic. The morning storms are now weakening overhead and and north of the Catalinas. The summer thunderstorm season, for many parts of the state, came along after mid-September - certainly true here at the house. Total rainfalls this morning are again split between two separate events - for example the airport had 0.17" in the evening and added 0.48" after 4:00 am this morning. Here at the house I estimate we had 0.20" last evening and added 0.50" this morning for a total of 0.70" at 6:00 am - has been raining some since then as the storms weaken. Across the ALERT for 24-hours ending at 6:45 am MST there was once again 100% coverage, with numerous sites having more than half an inch. 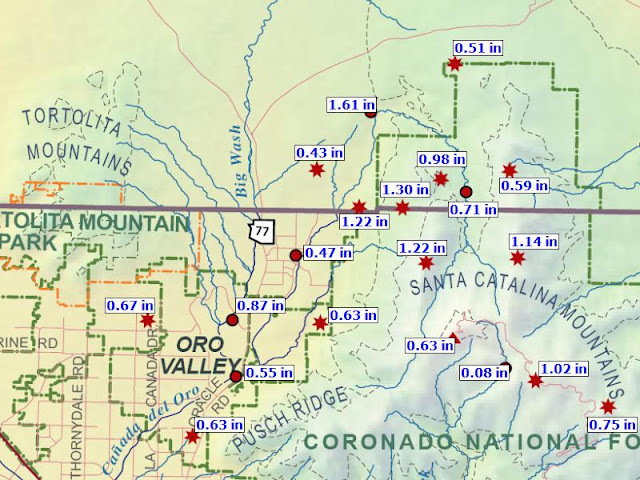 Seven stations, mostly on north side of Catalinas, had more than an inch (Catalinas sector of the network shown below). The CG flash data illustrate what a substantial thunderstorm event has occurred during the past 24-hours or so. Above plot from Atmo shows detected CG flashes for the 24-hours ending at 1330 UTC this morning - note the intense storm and flash activity over the northern GoC, which is fairly unusual. 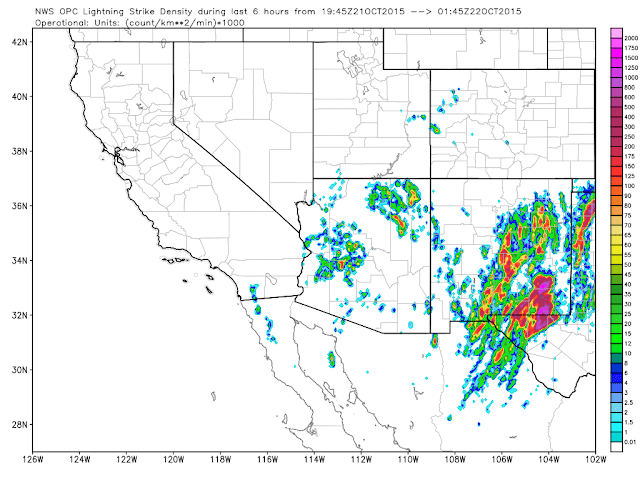 Below are two CG flash density maps from weather.graphics. The top one is for the 12-hours ending at 5:00 pm MST yesterday afternoon - only a bit of storm activity in eastern Pima County during the afternoon. Second below is for the 6-hours ending at 6:30 am this morning - with the thunderstorm activity focused over eastern Pima County, the northern GoC, and also continuing in New Mexico. The flash graphics are all based on CG data from Vaisala. The flow at 500 mb splits over southwestern Canada (analysis below is for 12 UTC this morning from NCAR RAL) with our closed low in the southern stream, continuing with fairly cold 500 mb temperatures. The low will be passing overhead today with some cold-core showers and thunderstorms, before we begin a drying out for the weekend. Very strong thunderstorm situation setting up for parts of Arizona, as the 500 mb short wave closes off to our west this morning. Above is 500 mb analysis for 12 UTC this morning from NCAR RAL - note the very cold temperatures with this feature. Below is NAM 12 UTC analysis. The leading, weak vorticity maximum is moving rapidly northward and there is widespread morning thunderstorm activity occurring ahead of it. The strong max to the west will be associated with the closed low and is forecast to come directly overhead by tomorrow morning. The morning skewT for TWC (from SPC - above) is again very unstable and the hodograph (below) is quite impressive for Arizona - somewhat of a classical severe storm situation, but well west of the Great Plains. The morning outlook from SPC (second below) indicates an unusually large area, for the Southwest, with a slight risk of severe thunderstorms. The WRF models at 06 UTC from Atmo don't forecast storms affecting us until well after dark. The radar forecast above is from the NAM version and is valid at 5:00 am MST tomorrow morning. Not obvious to me that flow over the mountains won't get storms going sooner.The WRF rainfall forecast (below, valid through midnight tomorrow night) indicates heaviest Arizona rains to our north and northwest, but also forecasts a huge event for New Mexico. Will Today Be Better For Rain On Ground? 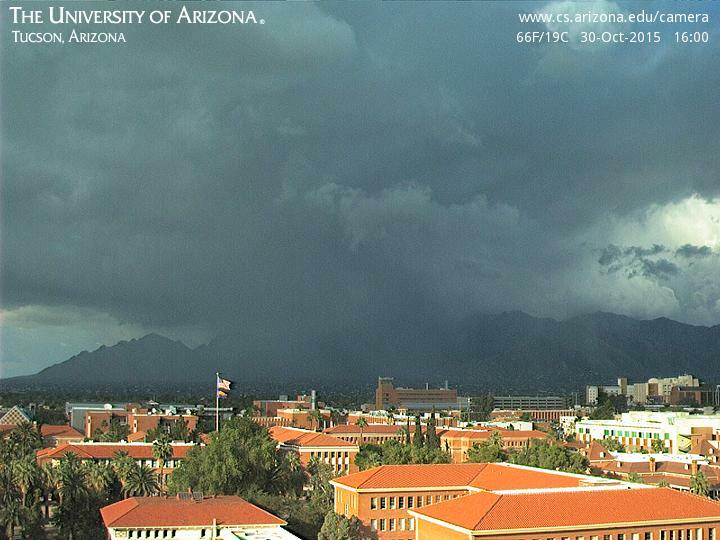 When Did Summer Monsoon Really End?